With all these calorie counting apps that are around and the pressure is better on us to look a certain way calorie counting can be an easy trap to fall into. Whilst it can be useful in some clinical instances I don’t think it is helpful for the general purposes of dieting. Formally, a Calorie is a measure of the amount of energy required to heat one kilogram of water one degree Celsius. It was first used in engineering and physics, but eventually found its way into nutrition, we have Wilbur Atwater to thank for that. Whilst it may make sense that tracking your calories, macros and nutritional intake will help you with your weight, overall health or dietary intake in fact it can have the opposite affect. It can lead to you becoming obsessed with counting everything you eat and feeling you have to stick within a certain number of calories per day. This will stop you enjoying your food and impact your socialising too. What if you are out with friends in a cafe, a once a week occurance and the cake you is 450kcals plus a coffee 150kcals but you are only allowing yourself to eat 1500kcals a day? That cake is 1/5th of your calorie intake for the day, so is it worth eating it? Do you choose to eat it knowing you will be over your calorie limit for the day but that you have enjoyed your cake and time with friends, do you choose to eat the coffee and cake but then restrict your calories the next day to make up for it or do you decline the cake and feel deprived and as if you cannot join in? I’d suggest that calorie counting can be a useful guide and tool for one off occasions but over the long term it has the potential to become obsessive. Following a calorie restrictive diet does not make it a balanced diet. You could be getting all your calories from just fruit and veggies or be skipping a whole food group out. There is also the question of is it even accurate? There is no way to accurately know the exact calories of the food apart from using a calorimeter in a laboratory. I don’t know about you but I don’t want to burn my food up each time! Yes this is worked out for us on food labels but that is a guide. A slightly different portion size, a different way of cooking, a slight change to a recipe and it will have a small affect. Does that matter? No not really as the calories are just a guide. Delving deeper, your body will also not necessarily absorb all the calories that you eat. For some foods such as nuts for example, a proportion of the calories are excreted. So even know you may be eating X amount of calories you are not necessarily going to be absorbing all of those. Other foods can make your metabolism work harder, again showing calorie counting to not be a 100% accurate tool. Personally I do not think counting calories on a daily basis is helpful and it can be a negative trap that you fall into. Instead look at the balance of your diet. Think about getting a range of nutrients in to your day and a wide variety of foodstuffs. Ensure you cook from scratch as much as possible, eating wholegrains and starchy foods, fruit and veggies, protein and healthy fats regularly. Enjoy what you eat, stop when you are full, eat when you’re hungry and be mindful of the food that you consume but not consumed by it. Having an eating disorder can make you feel invincible, it can sometimes be hard to see how being underweight and restricting your food intake can cause physical health issues, but there are so many knock on effects of being a low weight. When your body is not getting the nutrition that it needs it can lead to knock on consequences for your bone health as the minerals are take from yoour bones for use elsewhere in the body. Another big one is muscle wasting throughout the body including your heart. Your brain will start to conserve energy and shut down some less vital functions, brain power, memory, reactions and concentrations can be impaired. The blood may not be pumped as well around the body leading to cold extremities. Mood swings and poor sleep are common. Skin, hair and nails will start to suffer. I’ve had some people who have lost their hair in large clumps. Less of a physical symptom, as your body craves nutrition your mind becomes increasingly pre-occupied with food, recipes, the next meal, it can become all consuming. If you or someone you know is struggling with restricting their eating, it can be helpful to think through the physical affects on the body and use these as a motivation to focus on slowly eating more. If you need help with this, seek out an eating disorders therapist, dietitian or see your GP for signposting. I work with people with Skype, so get in touch if you need support. Diet and Detox. These words can be destructive. They suggest that you need to lose weight, that you have been doing things wrong, that you are not good enough, that your body is full of toxins, that you need to change the way you look. I see a lot of broken people with broken thoughts about their bodies and eating. a special course of food to which a person restricts themselves, either to lose weight or for medical reasons. restrict oneself to small amounts or special kinds of food in order to lose weight. a process or period of time in which one abstains from or rids the body of toxic or unhealthy substances; detoxification. 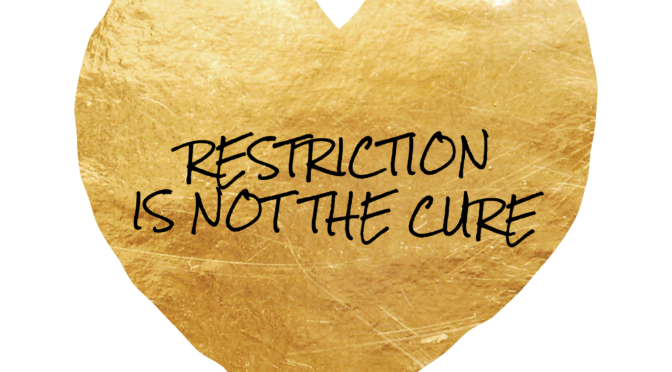 So it’s all about restriction, abstaining and getting rid of the bad stuff. NO! 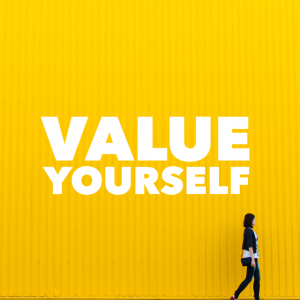 Thinking like this will lead to negative thoughts about yourself, lowered self esteem, negative body image and the feeling that you are not good. Now I’m not saying that there aren’t changes that people need to be making to their eating and their lifestyles. Some people need to gain weight for health reasons and others need to lose weight, some people need to have a healthier balance of foods in their days, others may need to be more active. What concerns me is the mindset and thought patterns around why these changes are made. Approaching it from a “I’m a bad person and need to change” mindset is not going to give long lasting positive results unless those thoughts are challenged along the way. Have a longer term approach. What are your long term goals? Where do you want to be in 1 year and in 5 years? Think about how your health and body need to be in order to achieve those goals. To be a nurse I need to be strong, fit and have a healthy relationship with food so I can eat around my shift patterns. To have children I need to be a healthy weight for fertility, I need to be a healthy role model with my lifestyle and I need to be able to cook a good range of meals. To eat an extra portion of vegetables every day. 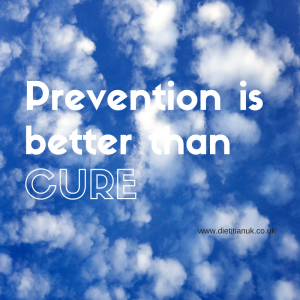 To get outside in the fresh air for some form of exercise 5 days a week. To cook a new recipe once a week. To switch off technology, read more and get to bed early once a week. To make healthy snacks ahead of time so I stay away from the biscuits. It’s not about having a strict diet plan and then beating yourself up when you can’t stick to it. It is about having a plan that is achievable and flexible. It’s not about cutting out food groups and thinking foods are bad. It is about moderation and balance. It’s not about only making change for a few weeks. It is about the long term. Be kind to you. Be achievable. Be true to you. 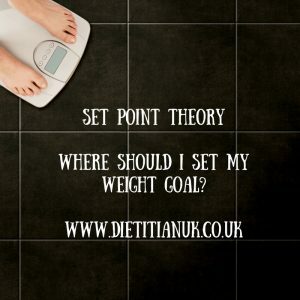 Where should I set my weight goal? Where should my weight goal be? Why does my body keep on gaining when I want it to stop? Why have I reached a plateau? If you were perfectly in tune with our bodies you would be able to eat when hungry, stop when full, even decide what to eat whilst thinking about the signals your body was sending out. This would likely result in your weight remaining relatively stable. Why? The theory is that the body has a genetically determined weight set point. This is the point where the body functions best. It will work to gain/lose weight back to this point. So with small losses and gains of weight your body will adapt it’s metabolism to bring your weight back. If you constantly ignore the bodies hunger/fullness signals you can override this system and push the body into a new “settling point”. Your body will work to get back towards it’s set point but external factors may mean this is not possible so it compromises. This can explain why you find it easy to gain/lose a little weight below your normal weight but then have to make bigger changes to alter your weight further. It also shows why a WEIGHT BAND is needed and not a single figure. Looking at the research on weight restoration after people have been at a low weight you find it takes time for them to get back to their healthy weight bands. For example simulation using the data from the Minnesota starvation study show it took over a year for the men’s bodies to resettle back to within 5% of their original body fat. In my practice of eating disorders I see similar results. Getting the body to regain weight back to it’s former set point is not as easy as you would imagine. There can be phases of regular weight gain and then plateau periods. It can take a few months for weight maintenance to be established. Almost as if the body is testing to make sure it is safe for it to settle into it’s groove again. Following a pattern of either bingeing and restricting or eating more and then compensating another day will make it harder for the body to normalise itself. Mindful eating, a regular pattern of meals and listening to your body’s signals is the key. When you lose weight, below the set-point, your metabolism decreases. Your body uses less energy for jobs such as digesting food. Your overall energy expenditure decreases and your resting energy expenditure decreases. So you use less calories than you were using. As you start to weight restore your metabolism will at some point start to increase alongside this. This can result in a weight plateau, but it can also help you justify eating more. How do your work out your set-point? This is the tricky bit. There is no direct way to measure it and it can change over time. For some women pregnancy will change the set point. Ageing can have an affect. Medications and illness too. What we do know is it isn’t likely to be dead on a BMI of 20. BMI is a guide and a range it isn’t definitive. So you may have to continue gaining past BMI of 20 and listen to your physical health signals. Your energy levels, your menstrual cycle, your bone health, the condition of your hair and nails, your blood results. Ignore the numbers on the scales and think about your body as a whole. General tips: look back over your weight history. If you have had a stable period when you ate normally and were moderately active then your weight at this time will be a huge clue. Look at the weight of siblings and parents. If you are female think about the weight when your menstrual cycle was occurring regularly, this is a huge clue. Remember, the body wants stability and to feel safe. So give it a routine and listen to what it is asking you for. If you need any advice then do get in touch for a Skype or face to face consultation. Muller, JM et al (2010). Is there evidence for a set point that regulates human body weight? F1000 Med Rep. 2010; 2: 59. Accessed via PubMed. 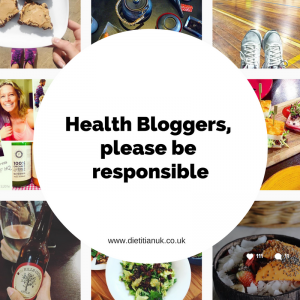 Dear health bloggers, please be responsible. Ok so a bit of a rant. However I am getting increasingly annoyed and saddened in my line of work by the impact that so-called health bloggers are having. I am seeing a definite impact upon young girls who are either following these social media gurus or are hearing about their nutritional messages through other channels. Sadly there is no regulation for these new nutrition types and yet with thousands of followers, their advice is wide reaching. Restricting your dietary intake under hear-say or because someone else tried it out and it worked, or due to social media advising it really isn’t the way to go. Firstly it can lead to your diet becoming overly restricted and make it hard to find enough foods to eat. Secondly it can leave you lacking essential nutrients. Thirdly this can spiral downwards leading to weight loss and disordered eating. So I spend a fair amount of my time with these clients, dispelling the myths and explaining the science. Some of these clients I manage to catch early on, before things have gotten too far. For others though the damage has already started. What started as healthy eating has spiralled downwards into overly restricted eating. They are too scared to eat certain food groups and have continued to lose weight, taking their bodies into an unsafe area. Many of these clients then realise what has happened and actually become quite angry. Angry at the incorrect advice they have believed and the influence of the health instagrammers. Angry that they have been drawn into this culture. Angry that they now have many months of hard work ahead of them to turn things around. Angry at the impact on their minds and bodies. Now I’m not saying that health bloggers are the reason for eating disorders. But I am saying that for some, the instagram health blogging world shows a world they want to be part of. The perfect body, the perfect diet, the perfect workout, the perfect food pictures. In my mind there is no perfect. At least not in this world. Instead we aim for balance with a healthy does of reality. However I am a 3o something year old, wife with 3 children. In my teens I too had issues with body image, I know I would have been easily influenced by the perfect diet and have followed the clean eating trend. Now with 2 daughters, I want to ensure they, and many others do not fall under this spell. So, if you give nutrition advice, please spare a thought for how it could affect people. How it could be miscontrued. Think about whether it is correct, evidence based and sound. How about we have the rise of the evidence based, trustable health bloggers? Eating disorders are a mean, cruel illness. Once seen to be a disease of affluence, there are now so many reasons an eating disorder can begin. The roots can be due to trauma, family issues, relationship problems, low self esteem, bullying, loneliness and wanting to fit in, a desire to be healthy, a need to achieve. Often there seems to be this air of mystery surrounding them and they can even be seen as a status. However, once you are in the cycle of truly trying to recover you will wish you had never become drawn into the disorder in the first place. Healthy eating taken to the extreme can seem like a good idea, but for some it can rapidly become an obsession. Counting calories, measuring portions, having the right balance of food groups can be positive. But when it lead to these measures being down to the nth degree, becoming obsessed with what your next meal will be and anxious if you have to eat something out of your plan, then there is a problem. Eat more calorie dense foods. Increase the variety of foods they eat. Eat more carbohydrates, fats and sugars. Will feel bloated after a meal. Will have to continue eating when full, pushing past that feeling of wanting to stop. Will have anxiety around mealtimes. Will gain weight and this may initially go to their tummy but will then redistribute. So you can see some reasons why it is so hard. All the things you fear are the things you have to go through. I wish I had a magic wand or an easy solution. 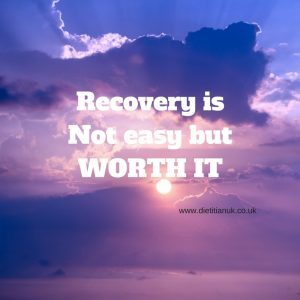 However recovery is definitely possible and so so worth it. It seems like forever ago now and I can’t lie – I hated it at the time. I really struggled. I did the ISP after an admission and it was tough. I hated it at the time. I remember going through a folder of portion sizes with you and lying through my teeth. I couldn’t accept the help. But I’ve been out of hospital for 3 years now. I’m small but not underweight. I had a lot of help and eventually knew how to use it. From there to now – I don’t think I could have got from there to where I am now without the support I received. It hasn’t gone. It’s still there but I’ve got a lot to lose now (life, friends, family and definitely not weight) and I won’t give that up for anything. I never said thank you at the time because I couldn’t see that you were helping me. So I wanted to say thank you now. 5 tips for recovery from an eating disorder. This may mean taking a break from normal life. A year out. 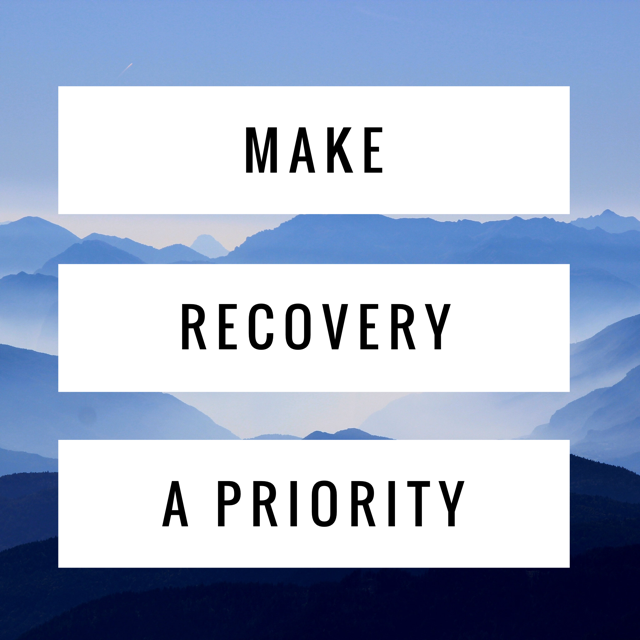 Recovery takes a lot more energy and effort than you may originally think. It needs to be right up your priority list. Time off work, school, certain friendships, travelling, exercise. Whatever it takes, this is important for this season. What do you like to do? It’s often hard to know what things make you, you. The busyness of life gets in the way of our identity. Book out some time to find you again. Try some activities you used to enjoy. Often creative projects can be a useful part of recovery. Maybe photography, baking, sewing, painting, collage, scrap booking, gardening, I love the phrase “Find what makes you come alive, then go and do it”. Sitting in silence and paying your full attention to your breath and body can help you bring an awareness of your thoughts and feelings. 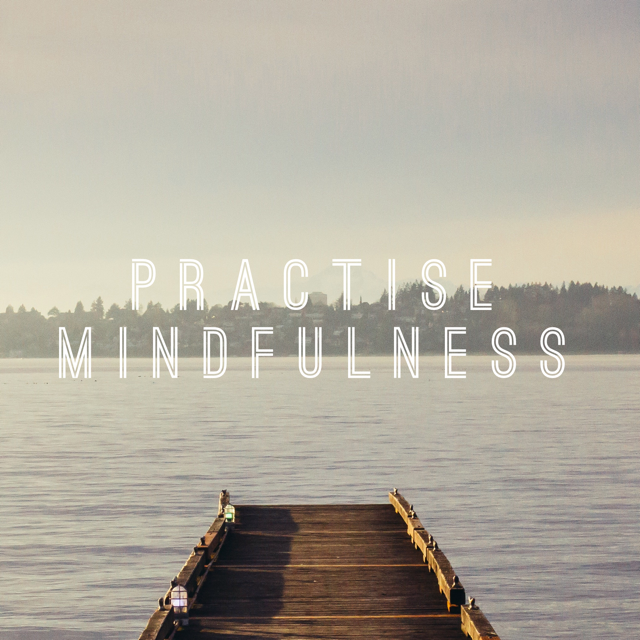 This practise helps you let go of the unhelpful thoughts and be more compassionate to yourself. 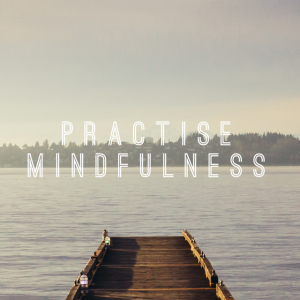 Practising letting thoughts go in your mindfulness practice will enable you to take this into everyday life so when an unhelpful thought comes along you are in a better place to acknowledge it, but not to act on it. 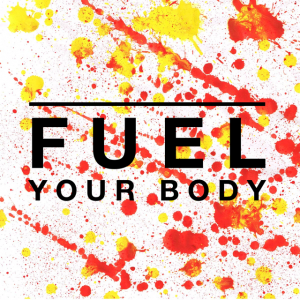 Take time to look after your body: nutritionally and physically. 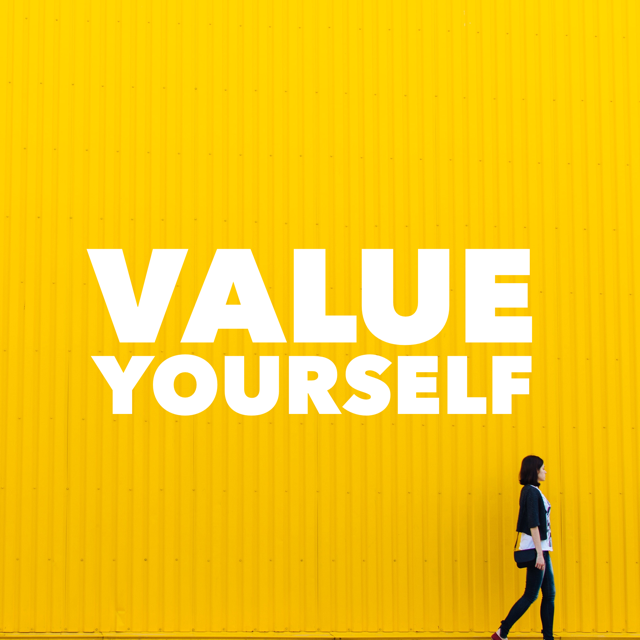 Some self care time in your week can make a real difference and can remind you that you are important and worth looking after. For some people an eating disorder can be a form of self neglect and may have some punishment aspects to it. Creating the emphasis on it being good to care for yourself and give yourself pamper occasions helps build self esteem and love for your body. Some ideas: A long bath, a manicure, pedicure, haircut, moisturising your body, shaving. Taking time to tidy your home, buy yourself flowers or something nice to look at each day, light candles in the evenings. The right fuel at the right times of the day is vital. This may mean going against your feelings and thoughts, but with repetition a routine will evolve and habits will form. It is likely your have no idea what normal eating should be for you now. Plan out 3 meals and 3 snacks a day with general timings to stick to if you can. There will always be days things don’t fit into your plan, that is also part of normal eating! 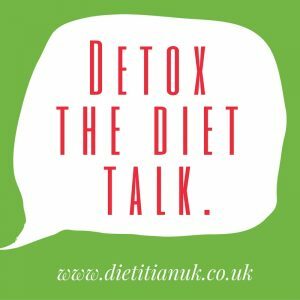 For more advice take a look at my healthy eating in Anorexia post. Go for as much variety as you can. There is no perfect meal plan, it’s all about making small steps and challenging yourself as often as you can. These are phrases I often hear from clients with eating disorders as we work on increasing their meal plan. Unfortunately there is no magic cure here and it is a stage that has to be worked through. What can help is understanding what is happening. In someone who has been under-eating for some time, the digestive track slows down. As a result food moves slower through the system. That feeling of the food remaining in the stomach for a long time can be true and is known as “delayed gastric emptying”. This can also lead to a heightened sensitivity to feelings of fullness and bloatedness. It is not necessarily that you are fuller than anyone else, but you may feel that way. 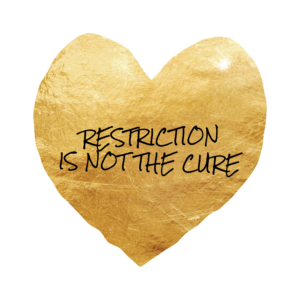 If you have an eating disorder you are likely to have been blocking out those feelings of hunger and of fullness too, there is a disconnection and a loss of sensitivity to them. Fullness is regulated by the hypothalmus in the brain. 20 minutes after you eat a signal is sent to the brain. This is an easy system to overide so it needs your sensitivity. This connection has to be rebuilt and relearnt which takes time. It may feel like you cannot trust the signals the body is sending. Actually it is your reading of these signals that is the issue, sticking to a balanced, regular intake of meals and snacks will help to realign your thinking with your feelings and food. Thoughts are powerful. 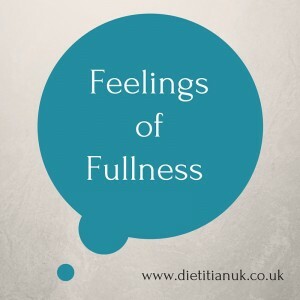 If you think you should be full or are full then this can trigger anxiety leading to feelings of fullness. Try to keep mealtimes relaxed and have a period of time afterwards where you distract yourself with something like art, craft activities, phoning a friend, reading a book. It takes 20-40 minutes for the feelings of fullness to subside. Number 1 tip for staying on track with your eating. Whatever changes you have decided to make to your eating there is something that can really make a difference to making or breaking that habit. It’s a commonly known fact that it can take 6-8 weeks to form a new habit, so if you have set yourself a healthy habit to form you need to stick with it. Whether you are gaining weight because you are underweight, losing weight or maintaining your weight, this applies across the board. I know because it is something I personally do and it is something that makes a real difference to the clients I work with. MEAL PLANNING. It isn’t rocket science I know, but it is everyday common sense science. If you want to make a healthy change to your eating, you need to plan it into your day and week. Just deciding on a change will not make you stick to it. To give yourself the best chance to suceed you need to have the right mindset, the right food in stock, have the right time to prepare it and have the right recipe to hand. Here is an example. If you need to increase your diet in order to gain weight, you could just say to yourself “I will eat more at each meal”. When it comes to that meal 1. Will you remember? 2. Will you have extra food to hand? 3. Will you panic and decide not to do it? 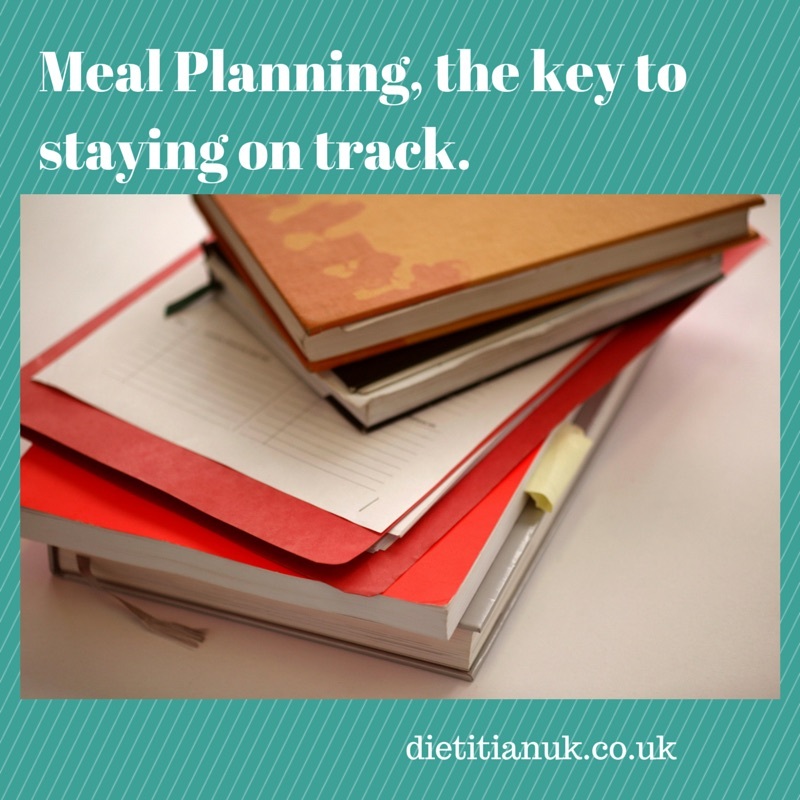 Using a meal plan is a useful tool as it make you plan out exactly how you will meet your goal. So where you will increase your current meal plan and exactly what extra foods you will add in. This means you can now prepare practically by making sure you have the foods available at the right times and prepare mentally so you are focused. If you make a plan you are more likely to stick to it than if you have no plan. There are several ways of meal planning. Some people like to use a whiteboard in the kitchen (this is what I do), others like a notebook they carry around with them and others like a printout stuck up in the kitchen. Think about keeping your meal plan visible and available at meal times as a reminder. Make meal planning a regular part of your week and it will really help you hit your goals. Eating disorders are not something we generally associate with men, there is a huge stigma attached if you do have an eating disorder and it’s not an issue frequently discussed. So I was so pleased to come across the Men Have Eating Disorders Too (MGEDT) charity. I was even happier to find they had a conference running within travelling distance for me. So off to Brighton I went. Below are some of my take home points. The prevelance of ED in men is 40%, this is a huge statistic and I certainly don’t find this in my clinical practice which suggests there are men with ED who are not seeking help. A recurring theme throughout the day was the lack of specific treatments and treatment pathways for men. Services are aimed at treating females not males. Gender differences mean that there needs to be a different approach to treat men. Therapy, group work and literature all needs to be adapted. One talk was looking at whether we need a specialist inpatient unit for men. Rather than fitting men into a standard ED unit, which can lead to them feeling isolated and like they stick out, how about providing a place specficially set up to treat and help them? It’s an interesting question and I can really see the benefits of doing this. Back to the gender differences that came out over the day. These show how our current society can lead to incorrect beliefs and values that are unhelpful and can perpetuate an eating disorder. Have a think about whether any of these are core beliefs you hold. THE BELIEF: Eating disorders are something only women get, so I am less of a man if I have one. Sexuality: eating disorders are primarily a female issue so there can be a thought that if you are male with an eating disorder you are less of a man…… or you are homosexual as gay men are usually more concerned with their weight and shape. The statistics actually show that this is not true, most men with eating disorders are not gay and a lot of men have an eating disorder it is just not talked about often. THE BELIEF: If I have an eating disorder I am weak. Male Identity – the image of a man being strong, muscular and able to cope. Having an eating disorder makes you vulnerable, it breaks you. Asking for help can be the hardest thing to do. It can therefore be hard to seek help. THE BELIEF: Men have to look a certain way. Body Image – over the years the media stereotype has changed to one of a man being muscular with broad shoulders, a large chest and a small waist. Not a very achievable look of course. Often we see the female stereotype and not the male one. THE BELIEF: Men eat and drink a certain way, I need to do this to fit it. Male eating habits – it is seen as ok for men to eat large portions and overeat which can make binge eating acceptable. Certain foods and drinks are seen as more “manly” – beer and red meat for example. What if you don’t actually like those foods or are not the kind of man who likes going to the pub for a pint? THE BELIEF: Real Men don’t cry, express emotion or talk about how they feel. Men don’t always like to talk about their feelings – again this can be linked to not wanting to be seen as vulnerable as this is a sign of being a girl or being weak. So it can make it even harder for a man to step out and seek help. Whereas actually we know that talking about your feelings really works and helps. Men come in all kinds of shapes and sizes, like all kinds of foods, can love to express their emotions and are all INDIVIDUAL. Don’t be afraid to be the man you were made to be. Seek help if you need it, therapy is an amazing tool. If you are a professional be aware, there are more men out there with eating disorders than you may think. 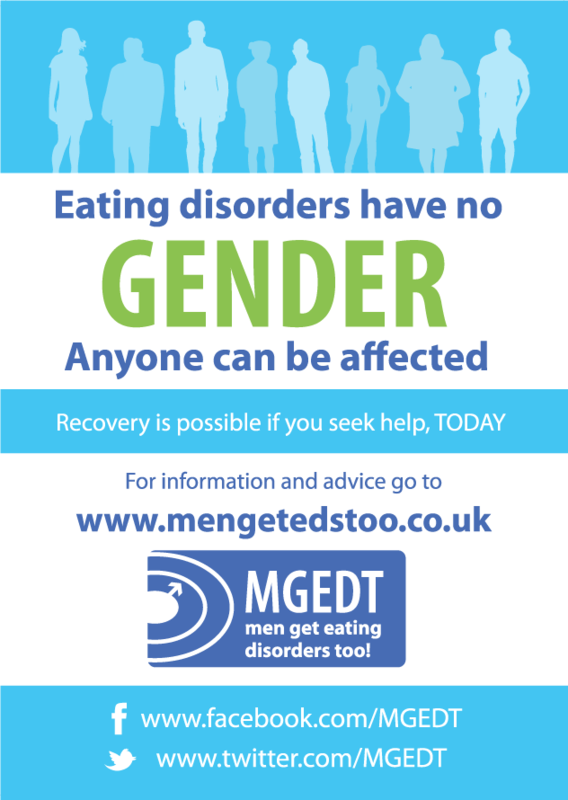 For posters and resources see the Men Get Eating Disorders Too website.